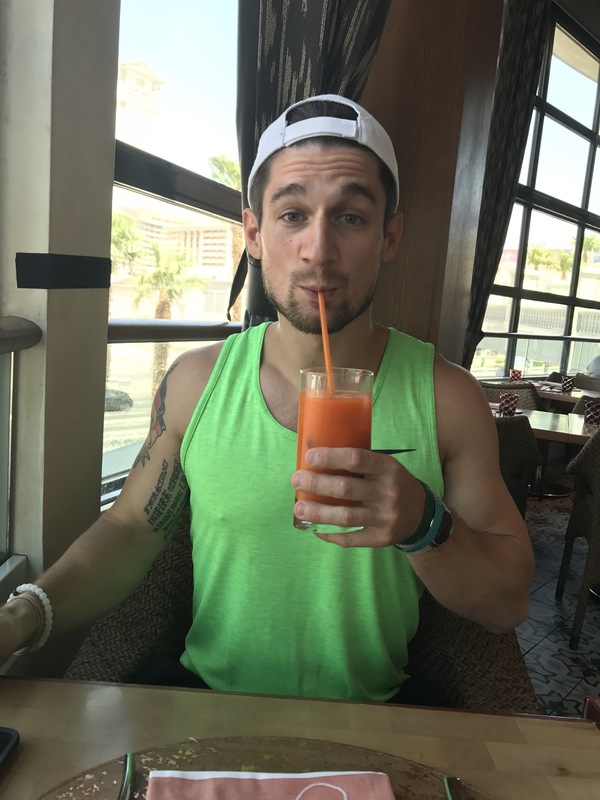 Yes, yes, I know I’m about a month late for this post, but this summer has been insane to the point where I’ve had zero time to work on my blog. We’ve been gone or occupied literally every weekend, but I’m not complaining! It’s been fun. Especially last month when Matt and I went to Las Vegas for the long Fourth of July weekend. 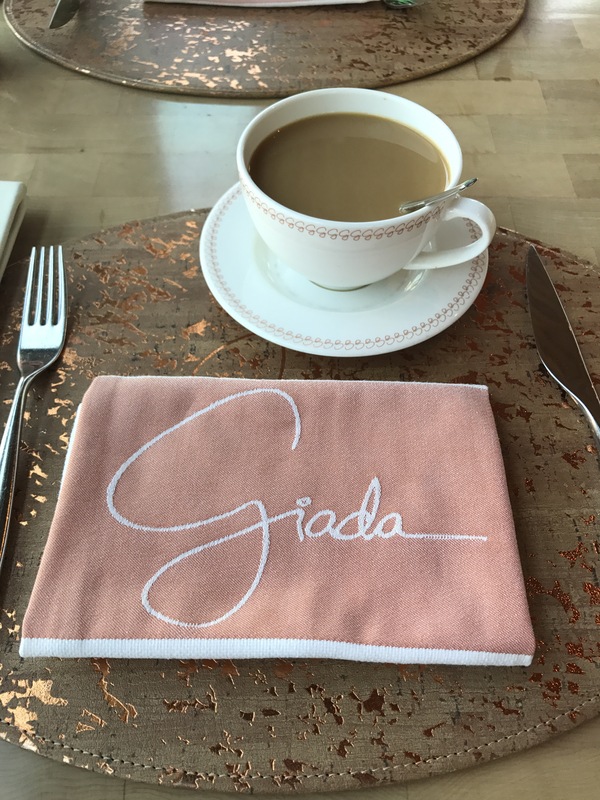 I had zero expectations or plans for the weekend except one thing: GO TO GIADA TO CATCH A GLIPSE OF MY FAVORITE CELEBRITY CHEF (aside from Bobby Flay). Although I knew with my luck I probably wouldn’t be able to actually see Bae, I was still interested in going to her restaurant and sampling her delicious food. On our first full day we had dinner plans for that night at Scarpetta (which was amazing, btw) so we decided to go for a quick brunch. We woke up that day pretty worse for the wear as Matt and I had gotten in late the night before and immediately went out on the Strip to explore. Needless to say I was craving something loaded with carbs and filling. It was more of an impulsive decision to go for brunch, because we were walking the Strip and saw her name on her restaurant and needed a respite from the 109⁰ heat. We ducked inside the Cromwell and followed her name through the maze of slot machines and roulette tables (I had to redirect Matt on several occasions) until we finally reached the restaurant. At first I thought it wasn’t open because the entrance was entirely empty, but after a closer look we realized that there were plenty of people sitting near the windows. The restaurant is huge and airy with a view of the Bellagio Fountains. 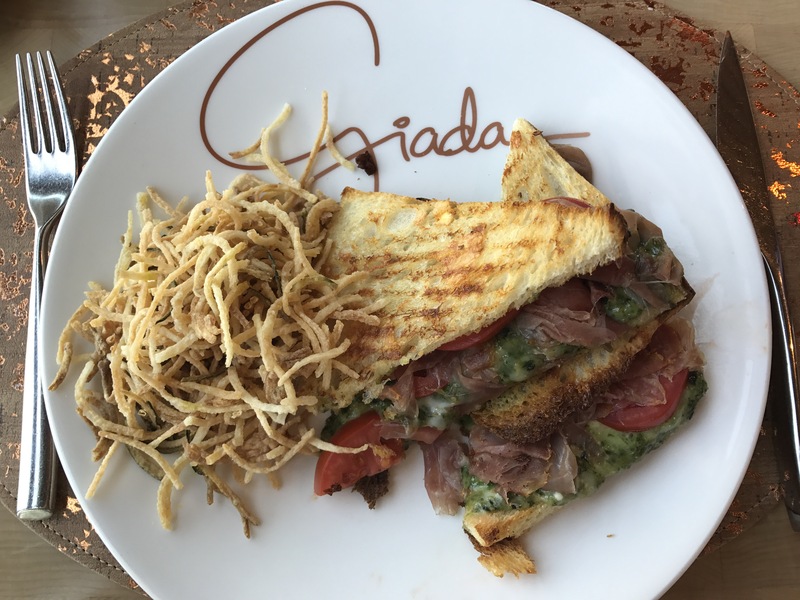 It has a modern and trendy vibe, but pays homage to Giada’s Italian roots by having a large display of fresh cheeses, herbs, olive oils, and cured meats when you walk in. There is a huge pizza brick oven in a central location behind the display of foods. We were seating by the windows and immediately were greeted and offered drinks. The service was exceptional and it seemed like there was constantly someone there to fill up Matt’s water glass (he likes to chug the whole thing as soon as he gets it… ugh). I ordered a coffee and Matt ordered “Orange Juice,” which is actually orange and carrot juice. As the waiter said, “Orange juice should be orange, not yellow.” After thinking about it I realized there has never been a truer statement. As for the menu, after looking at it I was a little sad that we hadn’t gone for dinner. The brunch menu did have some pastas that looked awesome but I wanted to see the full array of dinner items. I had read on Yelp that you should get the Chicken Marsala Meatballs, but I was just really craving something greasy and cheesy. The menu also had some egg dishes like frittatas, 4 different pizzas, a few sandwiches, baked pasta, and gnocchi. For some reason I was really hankering for a grilled cheese, so I got the lemon pesto grilled cheese and added prosciutto on it (turns out you can add prosciutto on anything), while Matt got Caprese Frittata with prosciutto on it. The lemon pesto grilled cheese was definitely a hangover cure. It had a good combination of salty from the prosciutto and cheese, buttery, and acidic from the lemon. I guess my only complaint is that my mind wasn’t blown. The lemon was definitely robust in the dish, a little too much so for what I was craving, and the sandwich was greasy. Although I definitely thought I wanted greasy going into this, the combination of greasy and lemon wasn’t something that I was prepared for. It was definitely good, but going back I would have ordered those darn marsala meatballs. Matt’s dish was exactly what he asked for and was expecting, and was good! 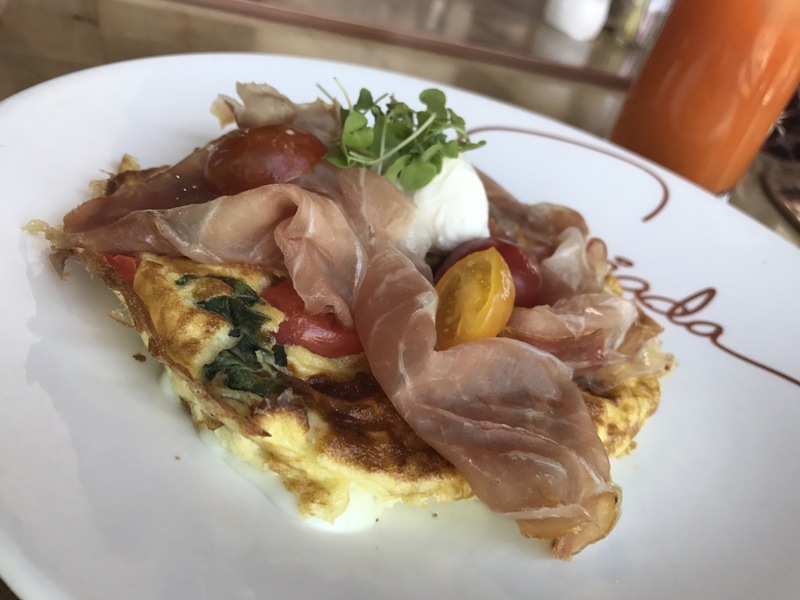 You can’t really mess up a frittata with tomatoes, basil, and prosciutto. I also got little zucchini scapecce on the side with my sandwich that turned out to be fried shoestring zucchini. They didn’t really taste like much but I ate them all regardless. So bottom line, go here for dinner. Brunch was good but I think dinner would have really been amazing. At the very least get a pasta when you go! And be sure to get me an autograph if you see Giada. 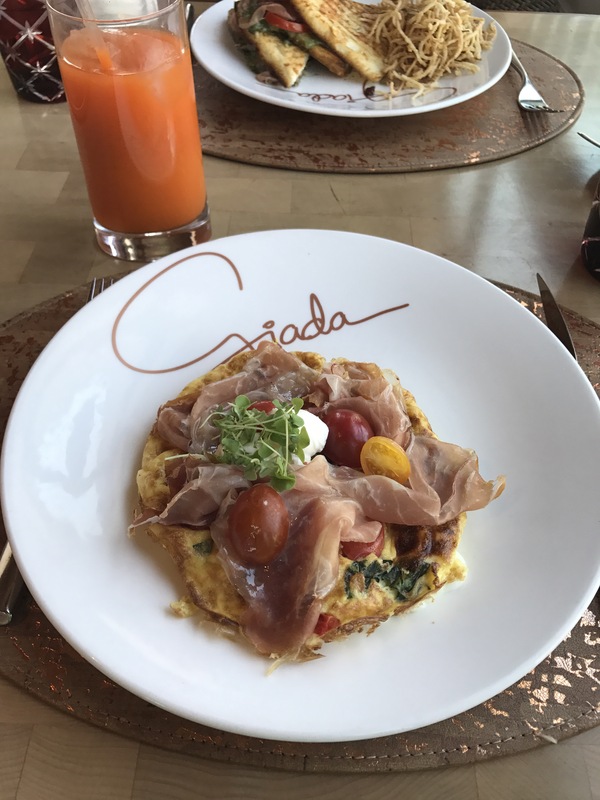 Giada gets 4/5 stars! Next Post Enter to Win the Ultimate Chili Challenge!